The fifth word in the Bible is created. We don’t talk about that a lot. We talk about the importance of the first 4 words: In the beginning God. But in that focus, we miss that God’s first action recorded in the Bible is the act of creation. The world we live in is the ultimate act of art, of imagination. God created the entire world as a beautiful piece of art for His own pleasure. The stars in the farthest reaches of space out of the sight, the sparkling fresh snow on a mountain top where no one but God will see it, the delicate flower that blooms and dies before any human comes across it…all of these beauties are enjoyed by God alone for His glory alone. As humans, we have imagination. It is one of the things that separates us from the animals. When we create any art, we are mirroring God’s action of creation. We are projecting God’s glory back to Him. Art isn’t a waste of time. It is another way to give glory to God and show that glory to others. As writers, we have a special kind of art. Words are a special part of God’s creating act since He created using speech, using words. He communicates to His people through the Bible, His Word. Jesus Himself is called the Word. Few other types of art come as close to creating something out of nothing as writing. Writers take something as wispy as ideas and as intangible as words and uses them to build stories and worlds and characters (For more thoughts on this, check out this blog post). When we write fiction, we are mirroring God’s work of creation. We are displaying the glory of God’s creation in our small and human work of creating. I think this is especially seen in writing speculative fiction stories. I could write more about this, but while I was brainstorming this post, Nadine Brandes wrote this beautiful post on this topic that sums it up much better than I can. 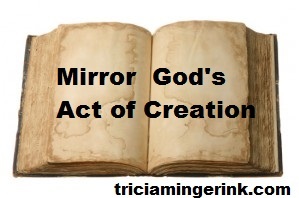 How do you mirror God’s act of creation in your writing? Hmm…I suppose I mirror him by creating lands, people and new creatures. 🙂 Nadine Brandes’ post was great! I’ve never really thought about spec fiction like that before.